REPORT: Chelsea linked with fantastic £22m move for Barcelona winger. 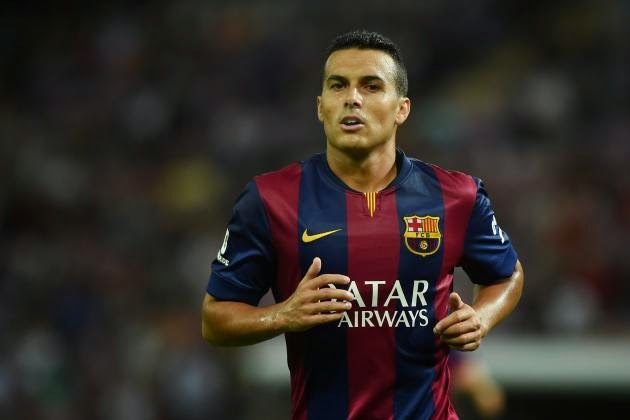 According to Spanish paper El Mundo Deportivo, Chelsea are preparing an offer of £22m to sign Barcelona's out of favour winger Pedro this summer. It's fantastic news in my opinion. I had seen this rumour appear in a number of different sources but now The Telegraph is reporting the same story there has to be real substance in this one. You think of Pedro and his lightening pace and work rate comes to mind first and foremost, followed by his goals, his influence down that left or right and side and finally his obvious friendship with Cesc Fabregas. Having signed for Barcelona at 17 years of age, Pedro was taught that famous Barcelona way of playing at their Academy La Masia with the likes of Lionel Messi and Fabregas. He became part and parcel of Pep Guardiola's team that took La Liga and European Football by storm. However, under the new manager Luis Enrique, he seems to have lost his way as Luis Suarez was signed to play down the middle, Lionel Messi has been pushed out wide right with Neymar playing down the left hand side. At present, Pedro has to settle for life on the bench, making bit part appearances as a substitute. So what of the link to Chelsea? As I said, I believe it's fantastic and this is definitely someone I would like to see here next summer. His overall play is excellent as he has proven to be a threat with his goals, his pace and his ability but it's his willingness to work hard without the ball that has to attract Jose Mourinho to him. Think of how Barcelona would press high up the pitch under Guardiola as a unit, how they would have everyone pushed up, hassling opponents in their own half and around their own box to win back possession. Pedro was part of that philosophy and that could be key for Jose Mourinho. Let's also not forget that the Barcelona players have seen what has happened with Cesc Fabregas here. They have seen that although the player has Barcelona in his heart, he was not happy at not being an important aspect of their team; forever being substituted in games and being asked to play in positions he didn't want to. They have seen him come here and have success of the League Cup and hopefully the Premier League title as one of the most important players of the team. Pedro can do the same here. There are and will be plenty of rumours and speculation about possible Chelsea signings this summer. However, for me, Pedro is one of the stand out reports I have seen and I really hope we can sign him for as little as £22m.